Sean of the Eff-Stop Local photo blog was taken aback when he noticed this HECKlE & JECKlE'S Chicken Shack sign while tooling around Tacoma, Washington. You may recall Heckle and Jeckle, the mischievous pair of magpies for whom our Chicken Shack owner named his fine restaurant. Perhaps it was in the spirit of these crazy cartoon birds' reckless abandon that the author of the sign chose to write in all capital letters, except, of course, for the lowercase L's. Or maybe it's just as I've always suspected — the world is coming to an end. Too weird. I almost want to call the phone number and demand to know the name of their establishment, their chicken shack. 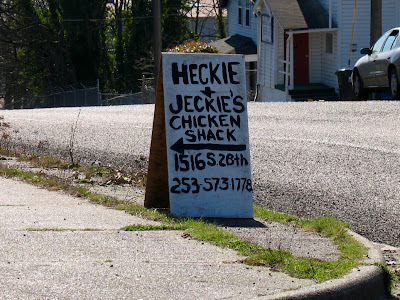 I'm not convinced it isn't Heckie & Jeckie.